Gold child size crown with assorted color gems. Crown measures 3.5” tall and will fit a head measurement of up to 19” with a foam band inside for a comfortable fit. 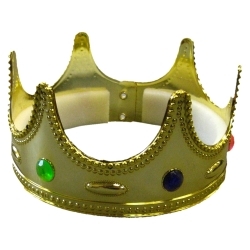 This crown is perfect for kings and queens of all periods, Halloween, Purim, or as a play time dress up costumes.